Ontario College of Pharmacy's gold medal winner in 1885, John J. McLaughlin invented the soft drink "Canada Dry Pale Ginger Ale" in 1904, incorporating as J.J. McLaughlin, Manufacturing Chemists in Enniskillen, Ontario in October 1905. 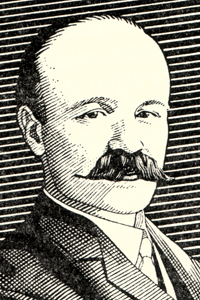 McLaughlin opened his first soda water plant in Toronto in 1890, receiving the first soft drink trade mark in Canada in January 1907 for McLaughlin's Pale Dry Ginger Ale. McLaughlin was the oldest son of Robert McLaughlin, founder of McLaughlin Carriage and McLaughlin Motor Car, which became General Motors of Canada in 1916.